Zion Canyon National Park is relatively small compared to other National Parks, but will wow you with its rock canvases and stone sculptures. 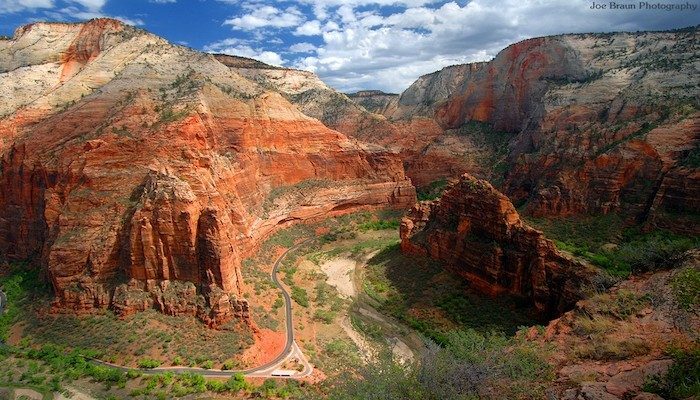 Located in Southwest Utah, about a 2 hour drive from Las Vegas, Zion marks the Western edge of the Colorado Plateau. While you visit you can appreciate the striking red Navajo sandstone cliffs that rise 2,000 feet and well as the Virgin River winding through the park. Zion is mainly a park for walking and hiking, as the park is small and most of the suggested routes are on mountains or on trails not really suitable for running. 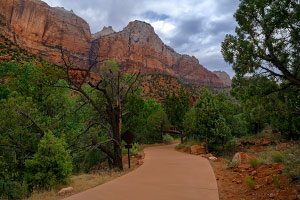 The two best options for running are the Pa’rus Trail, which is a 1.7 mile, flat, paved path that skirts the Virgin River in the flat and open lower section of Zion Canyon, and is close to one of the campgrounds. The other possibility is to run along the 6.2 miles Scenic Drive that runs from the Visitor Center to Temple of Sinawava shuttle bus stop along the canyon, with amazing views of striking red Navajo sandstone cliffs. A benefit here is that it is closed to cars in season. Note about Zion running: summers can be hot, with temperatures exceeding 100F. Please bring sunscreen and lots of water! The scenic drive runs 6.2 miles from the Visitor Center to Temple of Sinawava, with amazing views of striking red Navajo sandstone cliffs. This is the best running option in Zion. A benefit is that only shuttle buses, bikes and pedestrian traffic are allowed along this main park road from April to October, so one can run one way up or down the trail or just run segments, then hop a shuttle bus back. Note that there is not a wide shoulder, however the shuttle buses are very respectful of pedestrians and pass with ample space. The road from Canyon Junction to Temple of Sinawava is gently uphill. This is a popular hiking trail, and on busy days, too busy for running. The entire route is 8.7 miles round-trip, and the last mile is a hike and not a run. But if you go really early or when it’s not crowded, the hike through the canyon for the first 3 miles or so is a wonderful run. Quite hilly, but gradual.